Say buh-bye to bulky towels. This pocket-sized, high-tech performance fabric does the same job better. You're an adventurer, not a pack animal. Only the mini-est, highest-performing items make the cut for a backpacking trip, beach day, or even yoga after work. This ultralight, incredibly compact towel is poised to replace your cotton or microfiber version. Made of nanofiber, with threads even thinner than microfiber ones, the fabric absorbs 2.3 times its weight in moisture without the bulky, nappy surface of other towel textiles. An anti-microbial coating thwarts bacteria and lasts through repeated washings. The vented silicone carry case has a carabiner clip for attaching to your bag, or to the towel itself for near-instant hang drying. A mountain hike or an hour of the gym are enough of a workout—just say "nano" to extra weight or bulk. Charcoal color. Designed and engineered in Boulder, Colorado. Made in China. My husband is a huge cyclist and has taken multiple self-contained multi-day treks. This towel is perfect for hooking to his trailer and getting on the road without worrying that his towel will still be wet when he gets to his next campsite. 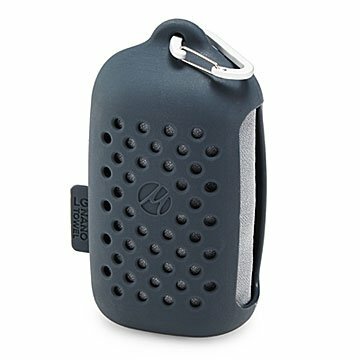 This product clips on to any backpack or belt or other loop or carabineer. Need a towel...got you covered. And it has other uses I haven't thought of.